Point Park students and alumni learned about the various career opportunities in commercial real estate from local industry experts at a panel discussion and networking reception held on campus last month. The University's Career Development Center along with the business management and accounting, economics and finance and information technology departments collaborated with Commercial Real Estate Women Pittsburgh to host the event. 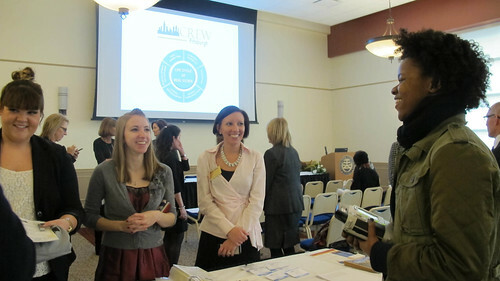 "Networking with the members of CREW was a great way for students and alumni to not only get information about the commercial real estate industry but also to make connections with professionals who can give them career advice and guidance on working in this industry," explained Angela Scaramucci, coordinator of employer relations for the Career Development Center. In addition to discussion on career opportunities in commercial real estate, the CREW panelists addressed topics such as the life cycle of real estate, challenges they face on the job, the importance of new graduates having a mentor and how to prepare for a career in this field. "I decided to come to the event because I have been interested in real estate for some time now and wanted to take this opportunity to network with successful people in this area of business. I received a lot of useful insight," said Tara Yanossy, an accounting major. "I learned that real estate is not just about buying and selling a property. There are many concentrations you can choose to focus your career on in this industry," added Yanossy. M.B.A. student Elizabeth Lang has some experience in real estate and decided to come to the event so she could hear perspectives from women professionals in the field. "I was intrigued by their discussions on environmental studies in commercial real estate as well as appraisals," remarked Lang. For Carlene Morgan, a global cultural studies major, this event allowed her to learn about new possible career paths. "Point Park gives students a lot of opportunities to listen to professionals from different job fields. It was interesting to learn about all of the career opportunities in the industry of real estate," said Morgan.